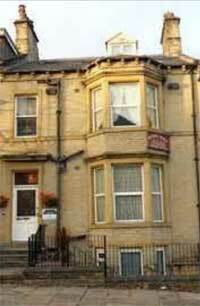 A cosy and gently lavish B&B off Huddersfield Road in Halifax town centre. Themed bedrooms and a first class breakfast. This is pleasant and creatively conceived option with rooms named after famous composers (check out the Strauss Room!) It's a Regency style terrace on a quiet residential street in Halifax town centre. The guest house is perfect for trips to Eureka! The Children's Museum and the nearby Victoria Theatre. It's also pretty hgandy for nights out on the town sampling the terrific restaurants and pubs. Guest can look forward to a hearty breakfast and free wi-fi. Each of the guest rooms is en suite. Halifax Train Station is just five-minutes walk. being just off Huddersfield Road means the guest house enjoys easy access to the M62 to Leeds and Manchester.